Thomas Arndell was appointed as an assistant surgeon to the settlement of NSW on 25 October 1786 and made the voyage aboard Friendship. Through an apprenticeship at a young age, Thomas would late practice apothecary in St Martin’s Le Grand. He had five legitimate child with his wife Susanna but neglected her for Isabella Francesca Foscari, a Jewish Italian singer. By this time he had qualified at the Royal College of Surgeons on 6 September 1781 he abandoned both women and signed on the East India Company ship Major. Returning to England and his wife he had another daughter before the First Fleet voyage. Elizabeth Dalton (alias Burley) who was indicated for feloniously stealing on the 15 September 1785, fourteen linen handkerchiefs, value 14s, the property of Joseph Earle, privily in his shop. Elizabeth received a sentence of 7 years transportation and arrived aboard Lady Penrhyn. By 1790 Elizabeth, who previously had a child, had attracted the attention of Thomas Arndell. Believed to be married by the Reverend Thomas Marsden in 1807, they had six children together. Thomas died in 1821 and was buried at St Matthew’s Windsor. Elizabeth survived until 1843 and was buried beside him. 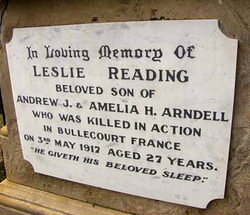 Mr and Mrs AJ Arndell, of “Verona” Meredith Street Homebush, have received information from the Red Cross confirming that previously received privately, that their younger son, Leslie Reading (who had been officially reported missing since May 3 last), was killed in action on that date. He originally enlisted in August 1915, but in consequence of a serious illness, contracted whilst in camp, he was discharged a few months later. On his health becoming sufficiently restored, he re-enlisted, and as a bomber in the Light Trench Mortar Battery, and left with reinforcements in November last. After a short training in England, he was transferred to the 19th Battalion, and arrived in France early in March. 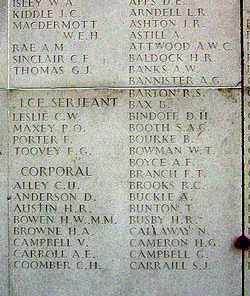 The company to which he was attached participated in the fighting at Bullecourt, where he was killed by a shell just as he had reached the German wire. Private Arndell was a descendant of one of the earliest settlers on the Hawkesbury River – the late Dr Thomas Arndell, Assistant Surgeon of the First Fleet, and for a time resided in this district, opposite Ebenezer Church (the oldest in Australia) with which many other members of succeeding generation have been connected since its foundation early in this last century.